Part of the mission of CHOICE of NY is to address the needs of our clients with sympathy and compassion that they may not experience in more traditional agencies. In many cases, the first step is to build a connection of trust and understanding that allows the client to open up and accept the possibilities of true healing and progress. Our socialization groups provide the perfect forum for both relationship building and personal growth. 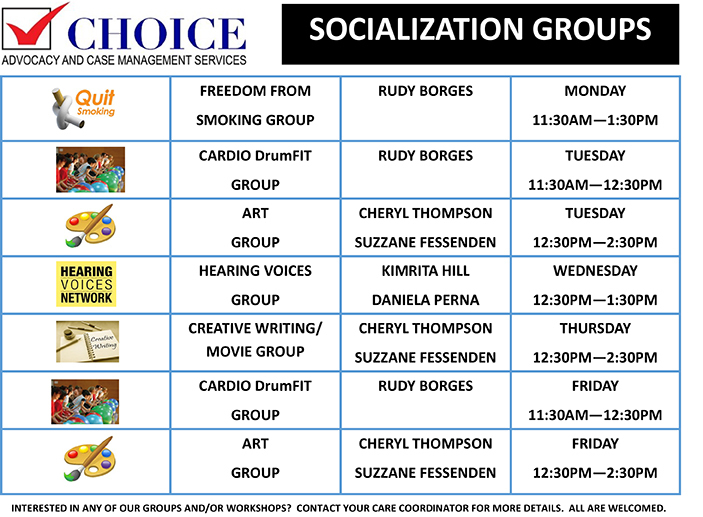 Many of our clients participate in our weekly groups: Visual Arts, Hearing Voices Network, CARDIO DrumFIT, Freedom From Smoking Group, and Creative Writing. Through these groups, clients learn to express and explore their feelings and motivations. The non-threatening, group-oriented atmosphere provides a sense of camaraderie and support not found elsewhere. Here is our current Socialization Group Schedule, and descriptions of each program are below. In Socialization Groups, we’ve recently added a cool, fun, hip new CARDIO DrumFIT Group. Cardio DrumFit gets you moving with high-energy music as you use a stability ball and drumsticks. It’s wonderful for both physical and mental fitness..and it’s great fun. The workout uses a variety of choreography/dance exercises incorporating the use of the ball and drumming like a rock star! 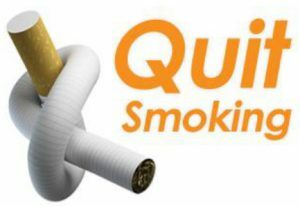 A weekly group faciliated by lung specialist, DR. JOSEPH D. GRANDERSON, M.D.. Clients, family, and friends are welcome but registration is required. Give us a call to find out when this rotating program begins. Our art group meets every Friday from 12:30 to 2:30 in White Plains. The group traditionally begins with a discussion during which participants are encouraged to share their “good news of the week.” The discussion helps to loosen everyone up and get the creativity flowing. Then the activities begin: paints, pens, markers, crayons, and canvases come out and everyone gets to work. What happens next can be truly amazing. 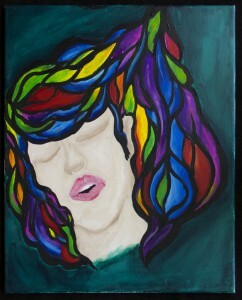 Emotions, sometimes long-buried, get expressed on canvas. Friendships and connections are formed over paint brushes and ink. Talents long-hidden are found. Self-esteem is built and fostered. Clients previously closed to the world around them take huge steps forward. Through art, they communicate. They socialize. They look inside themselves and in many cases, they begin the long journey toward healing. You can view additional art work in our online Art Gallery. Writing Group takes place every Thursday from 12:30 to 2:30. Journaling is a universally accepted therapy technique for exploring ones feelings and working through many types of issues. But it’s not that easy. Many clients want to write by they don’t know how. They don’t know what to write. That’s where writing group comes in. The writing group is also a discussion group. Clients get together and bounce ideas off one another. We show videos and use the content as the basis for writing projects. We expose them to all sorts of different types of writing from non-fiction to fiction and even poetry. We talk about what makes people feel comfortable and what makes them feel uncomfortable and encourage them to write it all down. It is despair that made him plunge deeper into his heart. He battled against his mental illness. Did he win or did he lose? Is that victory in Death? Or did the flames of sorrow consume him? My heart is dark from mental illness. My mind clouded with sadness to avoid a total civil war. I am on the road to all.